Ecuador’s Interior Minister claimed Thursday that Julian Assange smeared his feces on the walls of the country’s London embassy and had deplorable hygiene. Interior Minister Maria Paula Romo made the claim to reporters after Ecuador withdrew Assange’s asylum status and authorities removed him from the embassy and arrested him. Romo claimed that the administration of former Ecuadorian president Rafael Correa tolerated bizarre behavior from Assange, corroborating previous claims that he displayed unhealthy hygiene and aggressive behavior. “They tolerated things like Assange putting feces on the embassy walls and other behaviors far from the minimum respect that a guest can have,” Romo said according to CNN. Ecuador’s President Lenin Moreno also asserted that Assange mistreated the embassy guards and was “discourteous and aggressive” during his stay. “The patience of Ecuador has reached its limit on the behavior of Mr. Assange,” Moreno said, according to the New York Post. Even Assange’s closest associates claimed that he had terrible hygiene habits. “Julian ate everything with his hands and he always wiped his fingers on his pants. I have never seen pants as greasy as his in my whole life,” said Daniel Domscheit-Berg, a former aide to Assange, according to International Business Times. 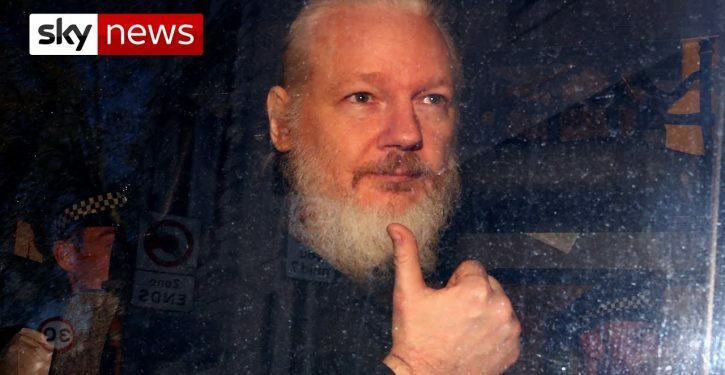 Assange faces an extradition hearing on May 2. U.S. authorities have charged Assange with conspiracy to hack a classified computer.